In June 1860 Tūkāroto Matutaera Pōtatau Te Wherowhero Tāwhiao became the second Māori king when he succeeded his father, Pōtatau Te Wherowhero. Tāwhiao's reign was dominated by the consequences of the British invasion of the Waikato in 1863. As a result of this war Tāwhiao and his people became refugees in Ngāti Maniapoto country (which became known as the King Country). About 1.2 million acres (just under half a million hectares) of Waikato land was confiscated by the government in 1864. Despite these hardships Tāwhiao eventually led his people back to the Waikato. In 2008 a movement that had looked dead and buried in the 1870s celebrated its 150th anniversary. 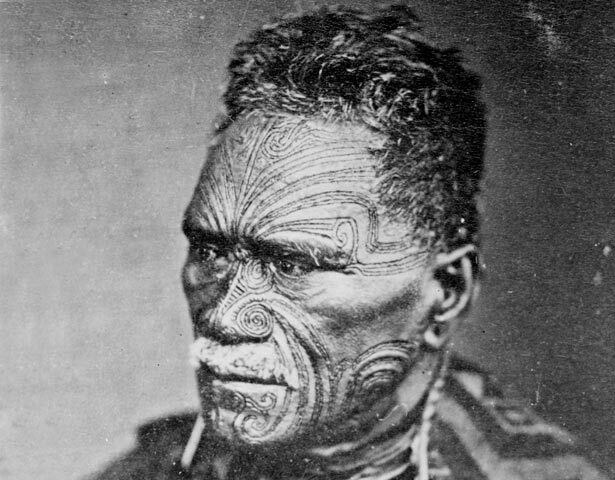 Tāwhiao, of the Tainui hāpu (sub-tribe) Ngāti Mahuta, was born at the end of the musket wars between Tainui and Ngā Puhi. It is said that he was named Tukaroto to commemorate his father's stand at the siege of Mātakitaki pā in May 1822. He was later baptised Matutaera (Methuselah) by the Anglican missionary Robert Burrows. In 1864 Te Ua Haumēne, the Hauhau prophet, gave him the name Tāwhiao. Tāwhiao was a student of the Bible as well as being well versed in the ancient rites of the Tainui priesthood. As King he was an important spiritual as well as political leader. He was regarded as a great visionary and many of his teachings and sayings were of a prophetic nature. Tāwhiao promised that those who had remained faithful to the tenets of the King movement would be redeemed and exonerated by history. Tāwhiao and his followers saw their predicament as a dramatic parallel to the biblical exile of the children of Israel. Tāwhiao, like his father before him, had initially opposed the fighting that had erupted in Taranaki in 1860. He was aware that war threatened the unity of the Kīngitanga and some supporters feared the consequences of a British invasion. In July 1863 British troops invaded the Waikato by crossing the Mangatawhiri stream. Tāwhiao had declared this to be an aukati – a boundary not to be crossed – and that any breach would be considered an act of war. Kīngitanga forces attempted to stall the British advance with significant battles at Meremere and Rangiriri in October-November 1863. The capture of Tāwhiao's capital at Ngaruawahia in December and defeat at Orakau in April 1864 saw Kīngitanga leaders withdraw from Waikato to Tokangamutu (Te Kuiti) in Ngāti Maniapoto territory. Some European commentators spoke of its 'withdrawal into sullen isolation'. The issue of land confiscation dominated dealings between the Kīngitanga and the government in the post-wars period. Tāwhiao was adamant that reconciliation was impossible without the return of all confiscated land. This was rejected by the government. In 1881 the King and his followers finally laid down their weapons and returned to Waikato, with Tāwhiao stating that 'this is the end of warfare in this land.' But they did not give up their efforts to seek compensation for the land they had lost. In 1884 Tāwhiao led a party to England to petition Queen Victoria. He wanted a Māori parliament and an independent commission of inquiry into the land confiscations. He stressed that the Kīngitanga was not separatist and did not reject the Queen's authority. He believed that it unified Māori so that they might more effectively claim the Queen's protection. In his view King and Queen could peacefully coexist. His petition was referred back to the New Zealand government, which dismissed it. Tāwhiao continued to help Māori address their concerns and petition the government. He also established the Māori parliament, Te Kauhanganui. Tāwhiao died on 26 August 1894 at Parawera. He was buried at Taupiri after a tangihanga in September which was attended by thousands. Tāwhiao left a legacy of religious principles from which his people would draw a future dream for Tainui: the rebirth of a self-sufficient economic base, supported by the strength and stability of the people. Nō Ngāti Mahuta, iwi o Tainui, a Tāwhiao. Ka whānau ia i te whakamutunga o ngā riri mau pū i waenganui i ngā iwi o Waikato me Ngā Puhi. Ahakoa he Karaitiana, i ākona ia ki ngā karakia, ki te kawa o ngā iwi o Tainui. He matakite ia. Ko tōna matua a Pōtatau te Kīngi Māori tuatahi. I tōna matenga i te tau 1860, ka kake a Tāwhiao hei kīngi, hei oranga wairuatanga mō tōna iwi. Mō ngā tau e 34 ka whai, ko ia te kīngi Māori. Ka noho ngā tau tōmua o tōna kīngitanga ko ngā tau tutetute nui i te hītori o te noho a te Māori me te Pākehā ki Aotearoa. Nā te urutomo, te hingatanga i roto i ngā pakanga, te raupatu o ngā whenua 1.2 miriona eka o Waikato, ka rere a Tāwhiao me tōna iwi ki te Rohe Pōtae whakamarumaru ai. He maha ngā tau ka noho rātou ki reira. Ahakoa ngā hui i tūtū ki ngā minita me ngā āpiha a te kāwanatanga, kāore he hua i puta. Ko te kupu a Tāwhiao, i riro whenua atu me hoki whenua mai. Kāore i manaakitia tēnei hiahia ōna e te kāwanatanga. Nō te tau 1881 rā anō tukua ai ngā patu a Tāwhiao me tōna iwi, ka hoki rātou ki tō rātou kāinga i Waikato. Engari ka rapua tonutia he paremata mō ngā whenua i raupatutia, ā, ka nui atu ngā tautoko mō te Kīngitanga. I te tau 1884 ka ārahina e Tāwhiao tētahi tira ki Ingarangi ki te kawe pitihana ki a Kuini Wikitōria. Ka tono ia kia tū he Pāremata Māori, tētahi kōmihana hoki hei rangahau i ngā whenua i raupatutia. I kaha ia ki te whakaputa i te kōrero, kāore te Kīngitanga i te hiahia kia noho wehe, ka arongia tonutia te mana o te Kuini. I ngana ia kia whakakotahi te iwi Māori, e pakari ake ai te tono i ngā manaakitanga a te Kuini. Ki tāna titiro, taea noatia ai te haere ngātahi o te Kīngi me te Kuini, ko te Atua ki runga. Ka whakahokia te pitihana a Tāwhiao ki te kāwanatanga o Aotearoa; kāore i arongia. Ka mahi tonu a Tāwhiao kia rongohia ngā āwangawanga o te iwi Māori, ka pitihana tonu ia i te kāwanatanga. Nāna ka tū Te Kauhanganui, arā te Pāremata Māori. Ka mate ia i te tau 1894. We have 1 event in history, 40 biographies, 4 articles, 2 comments related to Tūkāroto Pōtatau Matutaera Tāwhiao. I am a direct decendent on both sides of my family (Mum and Dad) , and i would like to say a heary Hello to all of the mny hundreds of fellow decendents .